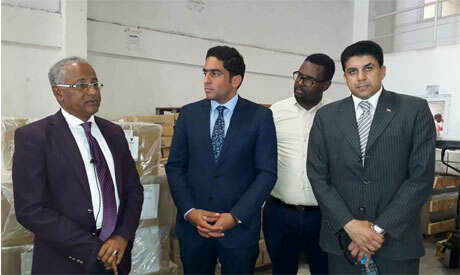 The Egyptian embassy in Somalia delivered two tonnes of medical supplies to the Somalian health ministry on Friday, Egypt's ambassador to Somalia Walid Ismail said in a statement on Sunday. The humanitarian aid shipment was donated by the Egyptian Agency of Partnership for Development (EAPD), which is part of the Egyptian foreign ministry. Ismail said the aid was donated as a matter of "brotherly relations" between the two countries, as Egypt helps a partner to combat drought and related diseases, as well as severe injuries resulting from terrorist atacks. Somalia is suffering from a prolonged, devastating civil war between the government and radical militant groups. Egypt has been providing aid to help the Somali government cope with the consequences of the conflict. In May 2017, the Egyptian Armed Forces sent a military transport plane with food and medical supplies to Somalia.